Since I provided two setups for the bears a couple of weeks ago, in the attempt to be fair, balanced and unbiased, here are two setups for the bulls. Neither has provided a confirmed buy signal yet but both are very close and have excellent upside potential. 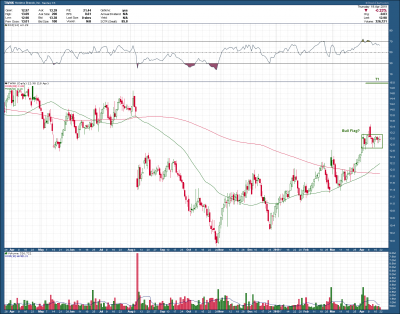 The first is Adtran, ADTN, which after falling 40 in seven months, has started to form a nice base. 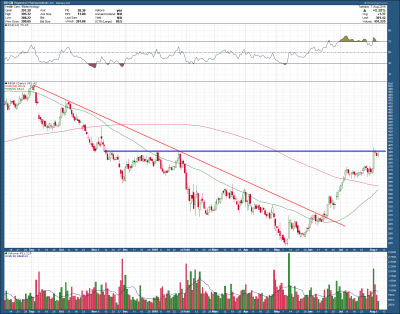 Price sits just below near-term resistance, its 200 day moving average and long term trend line. On the positive side, price is above a rising 50 day moving average, has formed a tight flag pattern after a spate of large institutional buyers stepped in and has formed, but not yet broken out of an inverse head and shoulders reversal pattern. Ideally, I would prefer to see price drift sideways further and create better symmetry (right shoulder is currently shorter than the left) before it moves higher. A confirmed breakout provides a target that is at the underside of the open gap made at the end of last year, a 20% target from here. Of course, all gaps eventually get filled so I would expect price not stop at bottom of the gap and instead easily move though it and instead find resistance back at December’s. If so, the upside target improves to a 38% gain. The second opportunity is in Regeneron, REGN. 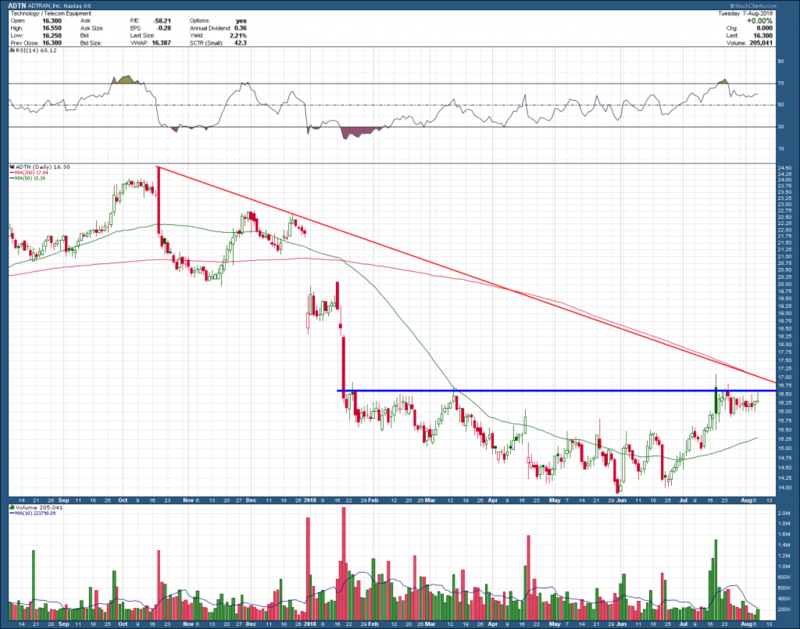 As you can see it is much further along in its recovery from a large selloff than ADTN is. After falling 43% in ~8 months, REGN found a bottom in early May. Since then, price has climbed above its long term trend line, 50day and 200day moving averages. Additionally, the 50 day moving average is now pointing higher and sits just fractionally below its 200 dma. 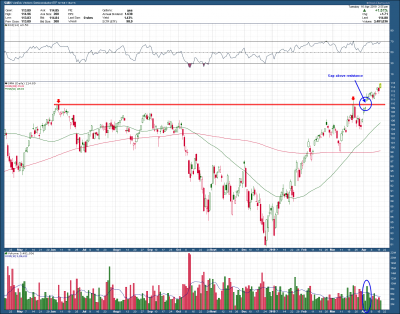 RSI momentum has moved out of the bearish range and now very bullishly aligned. Last week price popped higher on a very large institutional buy, topped right at prior resistance and since then has drifted lower on declining volume. 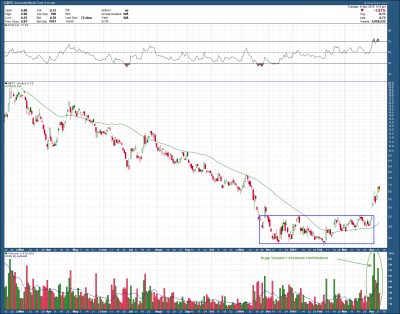 This is a very ideal set up after a large pop as price is consolidating, building energy for an extended move higher. One could look at the current setup as a very large inverse head and shoulders bottom reversal pattern which has a target back at last September’s highs some 30% above yesterday’s close. Like ADTN, I would like to see the current consolidation drift sideways long enough to improve upon and balance the symmetry of the pattern. I feel compelled to say both charts are not quite ready but are setting up for potential large upsides. It could be hours, days, weeks, months or …? These opportunities may never materialize so think of this as my ideas, your plan. As much as both patterns would benefit from further consolidation, the market does not care what we want so you need to be nimble as you stalk as they could breakout and trigger at any time (or never).